If I really want to impress my friends and family, I make a pavlova! They are just so pretty look at and they are not as complicated to make as you may think! Making a pavlova is pretty easy and relatively fool-proof! The results: crunchy on the outside and as fluffy as a marshmallow inside. 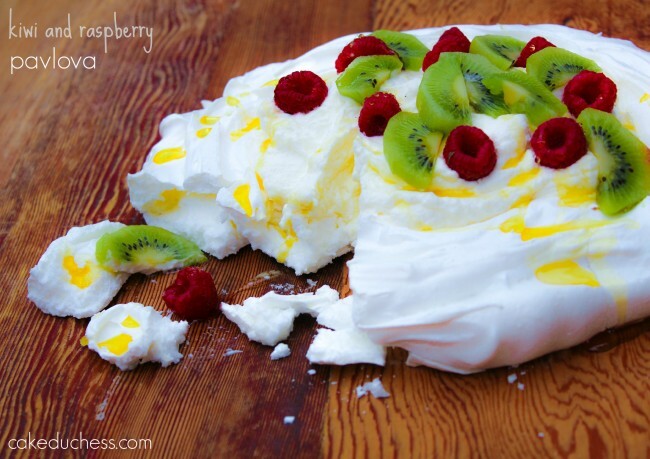 Topped with luscious whipped cream and gorgeous kiwis and raspberries…this is a dessert to IMPRESS!! 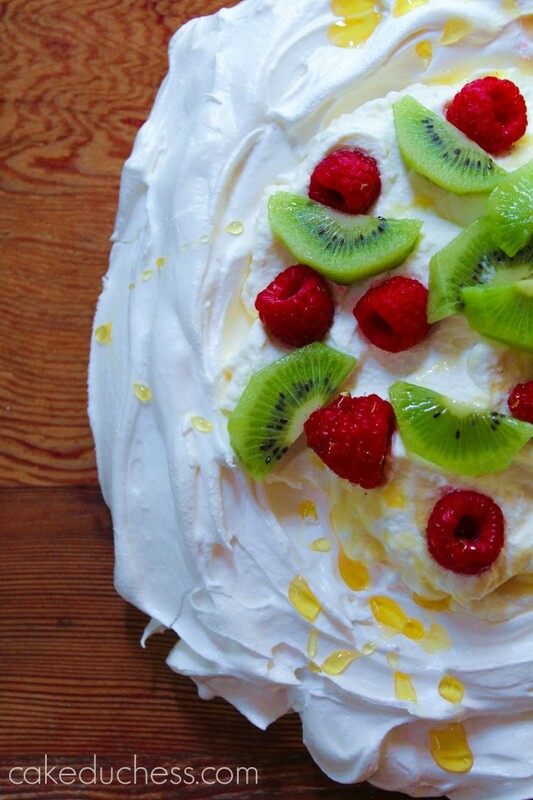 You could decorate your pavlova with whatever you prefer: fresh berries, cooked pears or apples (very fall!). For the chocolate lovers: you could add cocoa powder to the meringue and top with chocolate and cream…a chocolate pavlova delight! The pavlova is as fluffy as a cloud and very delicate! Be super careful (it’s very fragile!) when you remove it from the parchment paper. Important to remember: When the egg whites have quadrupled in volume, that is the time to add the sugar just a little bit at a time and keep on beating! and adding them slowly while whipping the mixture continuously. Even more important, when they are whipped to perfection…don’t wait to bake them. It’s important to get them shaped on your pan and put in the oven. No hesitating. My very important tip for you: let it cool completely on the pan before transferring to your serving plate. I didn’t wait the most recent time I baked it and my pavlova did break apart a bit before I had a chance to decorate it. Luckily, nobody complained! Even not so perfect to look at…it was perfection to taste! I slightly adapted a recipe from Saveur. oven to 200 F. Let egg whites stand at room temperature for 30 minutes. paper. Flip the paper over so circle is on the other side on the pan. In a small bowl, stir together sugar, cornstarch, and salt; set aside. top and sides with rubber spatula. Bake for 1 hour and do not open the open door (make sure you don’t open to just check on it…it will be fine). Gently peel parchment paper from the meringue and, using 2 metal spatulas, transfer meringue to a cake stand. Decorate with kiwis and raspberries. Drizzle on the honey.